Nose: Fresh and floral nutty notes. Attack: Fresh and vegetal hazelnut taste. Length in Mouth: Subtle touch of almond and vanilla. 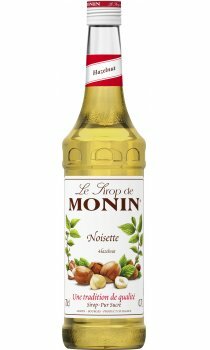 One of the top three speciality coffee flavours, along with vanilla and caramel, Monin Hazelnut syrup delivers the fresh taste and aroma of hazelnut with a touch of almond and vanilla. The nut of the Hazel tree, also known as a cobnut or filbert nut depending on species, hazelnut complements chocolate well. This makes it popular in confectionery as well as being a main ingredient in the chocolate spread Nutella and the vodka-based liqueur Frangelico. It is also a popular pudding flavour used in meringues and as a paste in Viennese tortes. Enhance your coffee, chocolate and milk drinks and create sophisticated dessert drinks with the moreish nuttiness of Monin Hazelnut. Best served: Coffees, Milkshakes, Dessert drinks, Cocoas, Steamed milks.